Mabel May-Yong(1883/?84-1945)[ was a German film actress of the silent era, possibly Australian born, known for her exotic roles and costumes. She appeared in around twenty films during the early years of the Weimar Republic. There are no assured facts about the private person of the actress Mabel May-Yong. Even her year of birth or year of death are documented although there are information in the internet which state 1883 – 1945. 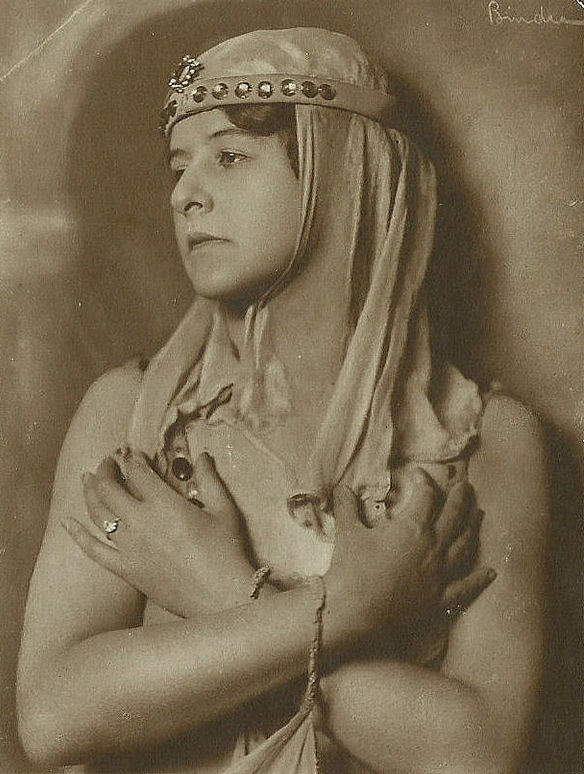 It is also not documented if Mabel May Young was baroness Alice Mabel von Schenck zu Schweinsberg, the source cites a newspaper article in the New York Times from October 28, 1914 when Mabel May Yong appeared on stage in New York. Other statements say that she was born as Alice Scharrer in Magdeburg in 1884. Did our exotic dancer possibly flee Germany and go back to the US to live? Schenck is not a very common name. Ancestry.com allowed a few connections in the right time frame. Some are obviously not our exotic dancer but others present a possible scenario. I can really encourage you to read all that was searched for and shared about her life at Lost Gallery. Since my strength lays in finding, enhancing and sharing art I just stick to what I am good in. Showing you the amazing photos that have been made.